The late-July version of League was a little different than the other ones I’ve attended. 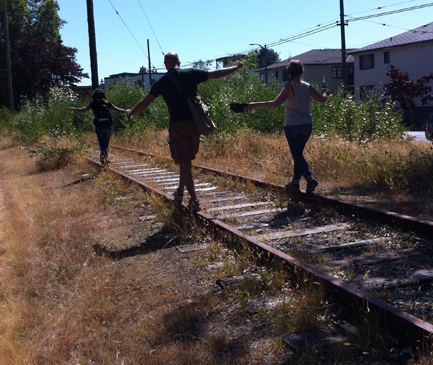 Usually we invent games at Elm Park in Kerrisdale, but this time we walked the eleven-kilometre Canadian Pacific Railway right-of-way known as ‘The Arbutus Corridor.’ Germaine encouraged us to come up with our own way to walk the line. In one respect, this focused us on our own individual means of play, but for the most part, the day was a long and pleasant get-to-know-you session. I felt like I was a teenager again, with nothing to do on a hot summer’s day but wander and laugh with friends. In the early years of the colonization of Canada’s West Coast, the Canadian Government granted the CPR a surprisingly large amount of land in Vancouver. As of 1886, the CPR had legal title to the area between Mackenzie Street in Kitsilano and Main Street, and between False Creek and 57th Avenue. 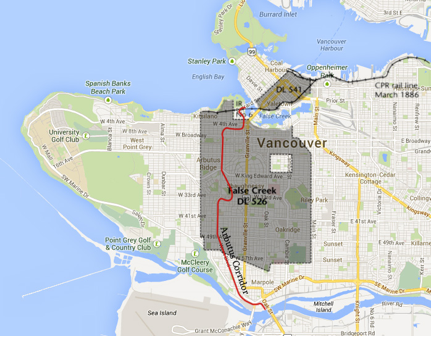 They also had title to almost half of what is now the downtown core of Vancouver. Most of that land has been sold off, but the 45-acre Arbutus Corridor that winds through the city remains as a reminder of this bygone era. This fifty- to sixty-foot wide strip is now caught in a no-man’s land of legislation between the City of Vancouver and the CPR. It’s still owned by the CPR, but it can’t be commercially developed, and can only be used as a rail, walking, or cycling corridor. A lack of dedicated use has transformed the corridor into a unique part of Vancouver’s landscape. The route is interspersed with community gardens, renegade vegetable patches, walking trails, cattails and blackberry brambles. 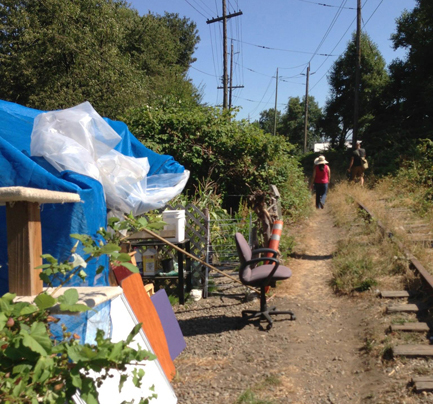 Trees shade the majority of the route, and the rail tracks are still there to balance along. Except for street crossings, the entirety of the corridor feels far removed from the pace and the development of the rest of the city. 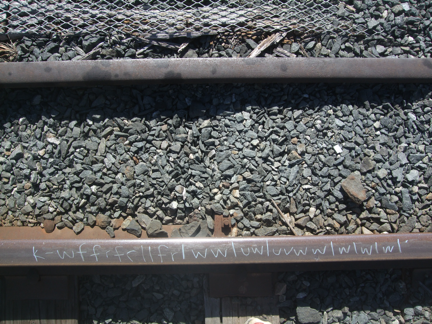 I didn’t know what I would encounter when walking this route, so I decided to let the railway speak for itself. Every once in a while, I’d pick up an object from the ground, scratch it along the metal rail, and do my best to transcribe the sound it made back onto the track. 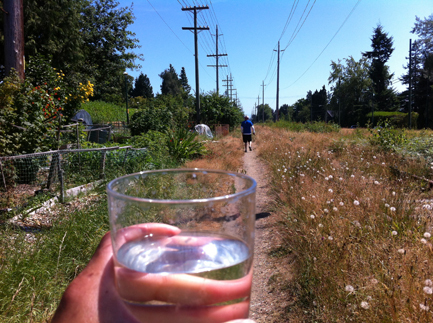 Germaine’s means of walking the line was to take a glass of seawater from False Creek, and carry it (without spilling too much water) for the whole length of the line, and deposit the water at its southern terminus at the Fraser River. 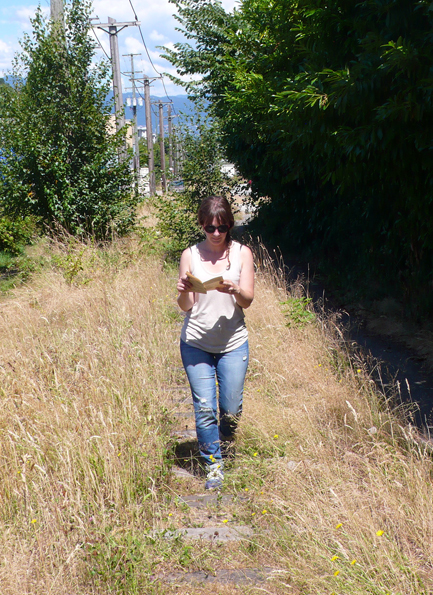 Sarah found nine pages of a discarded book in the first few minutes of walk, and made it her goal to finish reading them before the day finished. Thankfully, it was a decent book. She surmised that ‘something dramatic happened’ earlier in the story, but the nine pages maddeningly skirted the actual event without saying what it was. Ian was raised in this area of Vancouver, and was a treasure-trove of information about the railway. Glenda, a city planner living in Whitehorse, Yukon, shared her own experiences with land allocation and transportation planning. When I look at them separately, I don’t suppose that any of our mini-projects or stories were of any consequence. But I think something significant happened on the walk, as it does on every League day I have attended. A diversity of people, many who have never met before, get together and enjoy each others’ company for an afternoon. For me, this is the important thing about League — we are devoting time to the dying art of informal play, and we are remembering the joy of doing nothing in particular – making rules and games not as a means to win, but as a means to enjoy spending time together. 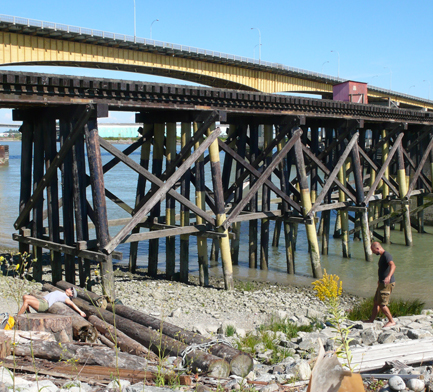 At the Fraser River, Germaine dumped her glass of False Creek water in the river. Mission accomplished. We quietly dispersed for a few minutes along the bank of the river, kicking at stones and examining the detritus that the river had left on this muddy shoreline. The sun was starting to fall in the West. Tired, hungry and sunburnt, we hopped on a bus and headed back to our respective lives.